K&L Bistro, 119 S. Main St., Sebastopol. 707.823.6614. 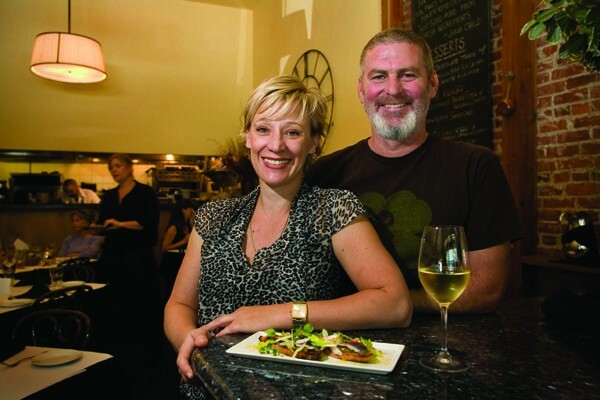 POUR DEUX Karen and Lucas Martin's Sebastopol restaurant, often packed, excels at French-accented classic dishes. The talk in Sebastopol these days is all about the Barlow, the large retail and light industrial development currently under construction on Highway 12. The project is pulling in a number of businesses (Kosta Browne Winery, Rosso Pizzeria, Community Market, Acre Coffee, Woodfour Brewing Co.) that have residents buzzing with expectation. At least four existing downtown Sebastopol businesses (Taylor Maid Farms, Village Bakery, the Uncarved Block and Quinn Brothers Boardshop) are relocating to the Barlow, and I'm not the first person in town to wonder what effect the project might have on downtown. Sebastopol's Main Street corridor doesn't have the same tourism draw as, say, the downtowns of Healdsburg, St. Helena or Sonoma—which is another way of saying it hasn't been gentrified yet. The main reason, as I see it, are the three lanes of Highway 116 that roar through what would otherwise be a quaint area. Will the opening of the Barlow this fall further diminish downtown Sebastopol's appeal? That remains to be seen, but once the Barlow opens, at least one downtown restaurant, K&L Bistro, seems poised not only to survive but to thrive. With dishes like roasted bone marrow, sole meuniere, duck confit and French onion soup, K&L is decidedly untrendy. Any restaurant that serves dishes such as these, however, must face the challenge of execution—classic dishes poorly rendered can come off as fusty and tired. But chef-owners Karen and Lucas Martin cook with skill and use prime ingredients, which allows them to bring timelessness to the standards of the bistro genre. Case in point: the house-cured sardines ($10.50). Over the last 10 years, sardines have migrated out of smelly tins to white-tablecloth restaurants, and you'd be hard-pressed to find a better preparation of the fish. The omega-rich oiliness of the meaty sardines is offset by a bright white-wine vinegar marinade, celery, and sour-sweet onion agrodolce sauce. Peel a filet off the fish, lay it on the accompanying grilled bread with a dab of the agrodolce—nourishing, satisfying and delicious all at once. For the full effect, eat the soft, highly edible bones.